Ebdon: not a great singer as it turns out. As we learned earlier this week, there is rarely anything worse than sport and music coming together. Unfortunately, top athletes invariably possess massive egos, which lead them to be believe that everything they touch will inevitably turn to gold. And that’s essentially the story of how Shaq got to make not one, but five painstaking rap albums. In the song below, Shaq claims he never did drugs, before admitting: “Okay, I drink Pepsi cos it helps me think”. Cringe. History dictates that there has only ever been two decent football songs. There’s the effort below and Three Lions. Of course, rarely does a genuinely great band like New Order offer their services to such a song. John Barnes provides the icing on the cake with what can only be described as an inspired rap. In possibly the most cringe-tastic duet ever, Chris Waddle and Glenn Hoddle actually recorded a song together. Entering the charts at No. 12 in 1987, ‘Diamond Lights’ is like all the worst excesses of the 80s summed up in one ignominious clip. 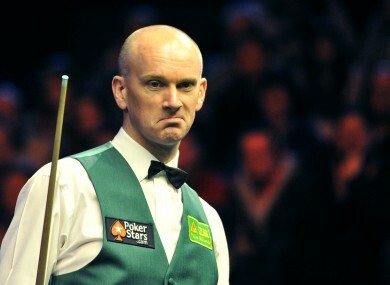 Peter Ebdon has often being attacked for his supposedly dull style of play, and surely the roots of this criticism stem from his impossibly boring first (and thankfully, only) single – a David Cassidy cover. The words “I am a clown” have never sounded so apt. Supposedly a dig at Hulk Hogan (but in the wrestling sense, rather than the real life sense), the song contains awkward lines like “You’re running from Macho/That’s what I heard” and features a weird grunt at the start for no apparent reason. Whoever green-lighted this abominable project deserves to be on the receiving end of one of Savage’s trademark diving elbows. The ex-Formula One champion Jacques Villeneuve took an ill-advised turn into singer-songwriter territory with his 2007 album, ‘Private Paradise’. Try to imagine if Phil Collins and Chris de Burgh did a collaboration, and even then, they would struggle to sound as asinine. There’s a good reason you’ve never heard of Wright’s mercifully brief flirtation with a music career. For his first song, the ex-Arsenal man came up with the ingenious title of… wait for it… ‘Do The Right Thing’. Unsurprisingly, it has bargain bin written all over it. Email “The Magnificent Seven: when sport and music collides…”. Feedback on “The Magnificent Seven: when sport and music collides…”.